Look up! That white-flowering, climbing vine that is now covering young trees and shrubs along pathways in Blacksburg is absolutely stunning– and its name is Virgin’s Bower! 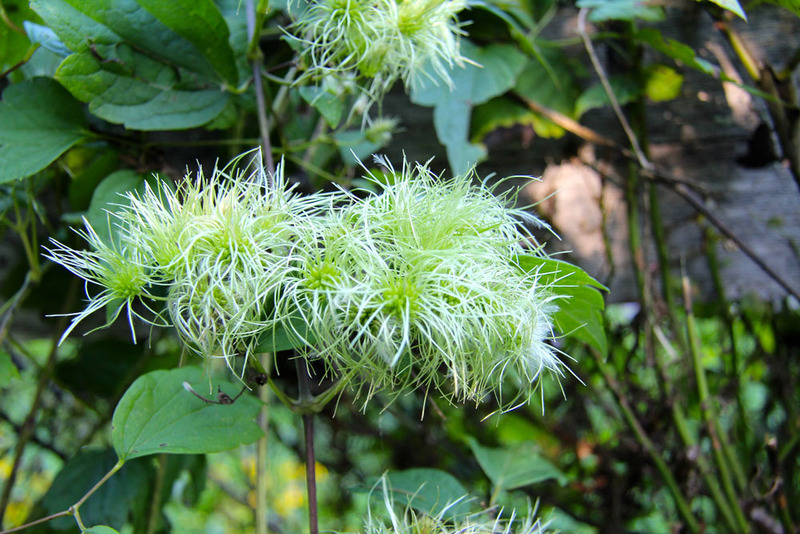 Perhaps not surprisingly, this pretty native is a kind of Clematis. The 4-petalled flowers are about 1-inch wide and sweetly fragrant. Pollinators, including butterflies, bees of all kinds, and even house flies seem to flock to these flowers. You may see three kinds of flowers on this vine. The male flowers are chock full of white, showy stamens while the center of the female flowers contain several green carpels. In addition to separate male and female flowers, some flowers may be both staminate and pistillate. Who knew? Click on the photos below to see if you can guess the gender of each flower. Also, take a closer look at the plant itself: it is a delicate vine with trifoliate, toothed leaves. The vine climbs by twisting its leaf stalks around the branches and leaves of other plants. This maneuver allows the plant to reach heights of up to 12 feet or more! Another common name for this Clematis species is Devil’s Darning Needles. This unusual name probably refers to the wildly-arranged, feather-like seeds (achenes) that will soon replace the current profusion of late-summer blooms. These plants were photographed at the Brown Farm (Heritage Park in Blacksburg). I’ve also seen it near the parking lot at Glen Alton and along the Deerfield Trail. I just went looking for my picture of Virgin’s Bower, taken a few years ago (and I couldn’t find). My picture was of the seed clusters! And I think it was taken in Sept around Loft Mountain. I thought it to be so unusual, and had to have help identifying it! The leaf reminds me a little of a post oak leaf! Love this vine but hear so often from urban dwellers that its too aggressive in their gardens.